SPO will automatically ask Facebook to update the cache for a page after you've updated the link preview. However, Facebook Debugger is not responsive. Occasionally, our app cannot update the cache. The page will look unchanged when shared to Facebook. You can press a few more times "Scrape Again" button. It won't have any negative effect to your store. 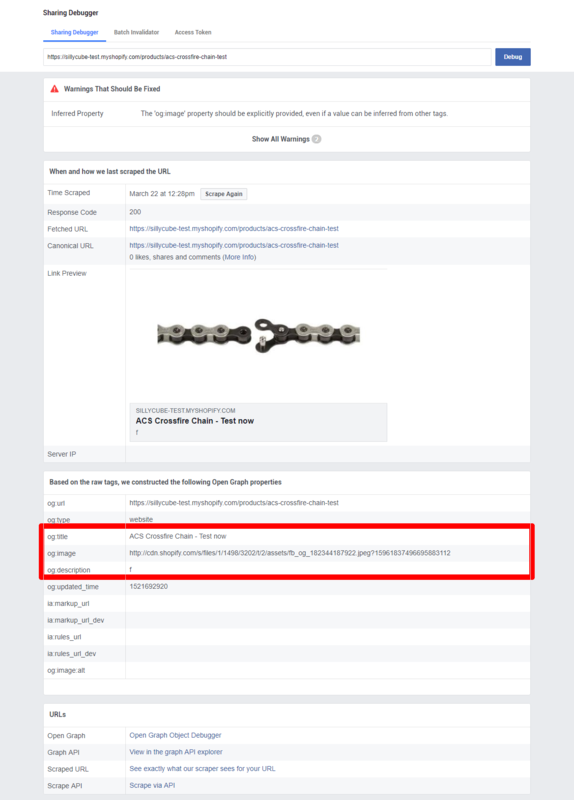 This article will illustrate how you can check the link preview in Facebook Debugger. Most issues about code snippet installation, product & home page link preview can be troubleshooted here. You can ignore most of the warnings as they are not really important. Now, you should check og:title, og:description and og:image to see if they are correct. If they are outdated, you can update the page in SPO (for products, blog posts and home page). Let's say I've updated the share image and title. I will use the debugger to clear cache. Press "Scrape Again" to clear cache. Usually, the page may not be updated for the first time. Don't freak out. Just press for a couple of times. It's not stable as I said. If the link preview is updated, you're basically all set. Otherwise, copy the link of og:image and put to the browser. If the image is not changed, the page was not updated before.